Latin Diagnosis: Subgen. Brachypetali similis, sed differt polliniis granulosis. stigmate longipedicellato, sepalis parvioribus quam petalis, labello calceolato gracile leviter plicato. Latin Diagnosis: affinis sect. Parvisepali, sed folia magna, 20-35 cm longa, homochroma viridis, inflorescentia uniflora, plantae exstolonosae, flori albo vel pallide viridi-flava, et labello distincto petalo minoris differt. In my opinion, the further segregation of Subgenus Parvisepalum into Sections Parvisepalum & Emersonianum is unwarranted. As quoted above, the new Section Emersonianum is differentiated based on 5 characters: presence or lack of stolons, leaf morphology, 1-flowered inflorescences, flower color, and pouch size. The only characteristic of these 5 which doesn't overlap between the two sections is the leaf morphology. The two species of Section Emersonianum lack the distinct leaf mottling of the five species in Section Parvisepalum. This one characteristic is not enough, in my opinion, to warrant formal segregation. 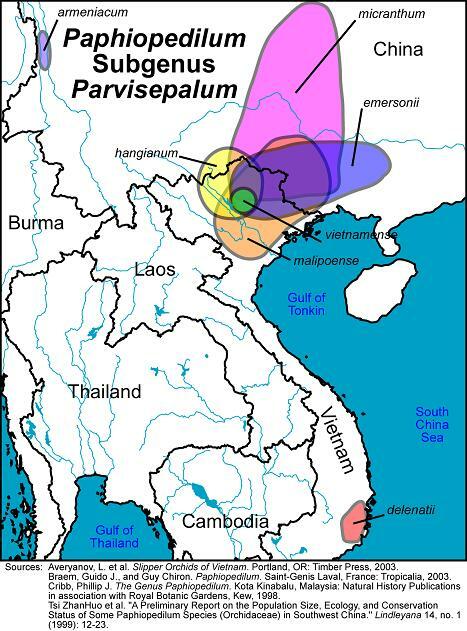 As a counter-example, the species within Subgenus Parvisepalum could just as easily be segregated based upon staminode morphology or along the strict presence vs. absence of stolons. 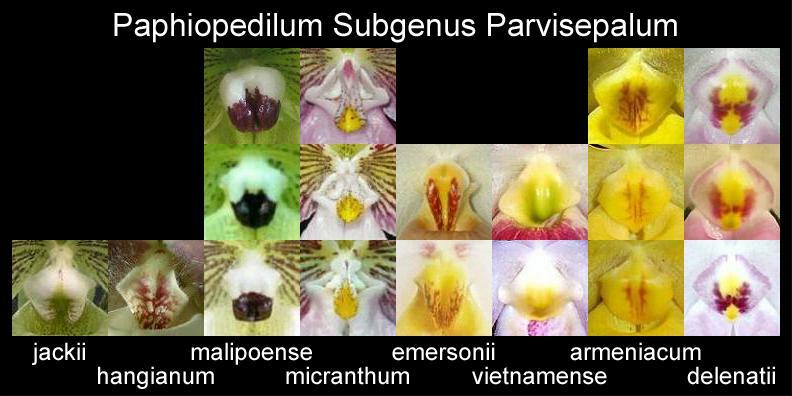 Averyanov, L; Cribb, PJ; Loc, P, Hiep, N. Slipper Orchids of Vietnam. Portland: Timber Press; 2003. 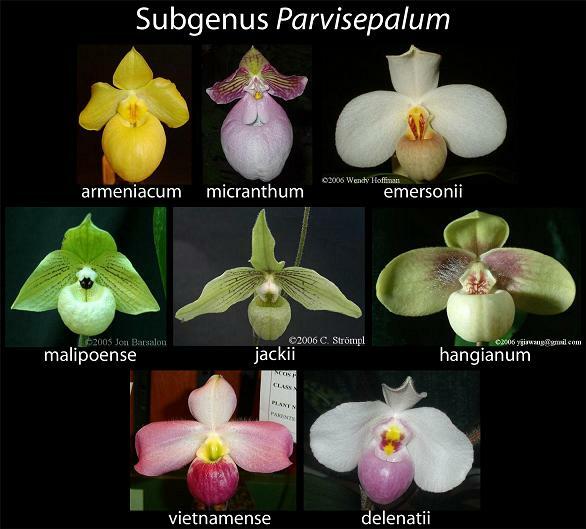 Karasawa, K, Saito, K. A Revision of the Genus Paphiopedilum. Bulletin of the Hiroshima Botanical Garden 5:1-69, Dec; 1982.